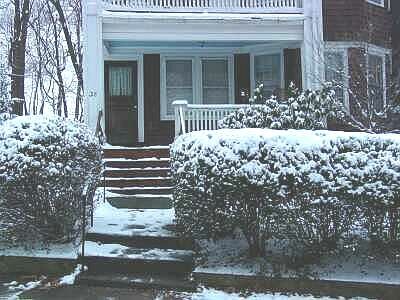 Here is where we live....we're on the first floor of this great old triple decker. Our street is like a little oasis, one block long, winding up a gradual hill and ending at a large park. As you can see, Winter was setting in. At least THAT week...in Boston you can never tell. The Franklin Park Zoo is a wonderful example of a city zoo, with a fantastic Rain Forest exhibit, as well as a gorgeous aviary and a "Butterfly Landing" once a year. The Gorillas are a regular highlight, as is the Holiday decoration festival in December. Franklin Park is one member of the Zoo New England system, which also includes the Stone Zoo in Stoneham, MA. Click on the photograph to be taken to the Franklin Park Zoo website. 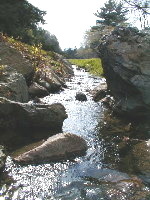 The Arnold Arboretum, as well as the Jamaica Pond and Franklin Park make up the southernmost parts of what is known as the "Emerald Necklace". This is a series of Boston parks and green spaces designed and build by Frederick Law Olmsted, who also designed New York City's Central Park. Working with Charles Sprague Sargent, Olmsted secured the land for the Arboretum through Harvard University who now uses the site for study and research. 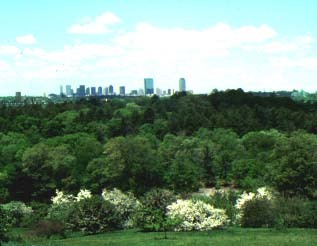 Above is a photograph of the Arboretum with the skyline of Boston in the background. It is easy to forget how close you actually are to the city while nestled in the trees here. Click the "Today's Weather" link below for in depth information about the weather in New England, as well as Doppler Radar and Satellite Maps. Then feel free to enter your own Zip Code for your weather. Jamaica Plain is a community rich in diversity, called home by members of many races, religions, ethnic groups, socio-economic classes and sexual orientations. You can hear a wide variety of languages spoken as you walk down Centre Street in Jamaica Plain, among them, Spanish, Portugese, Gaillic, Creole, Amharic, Hindi, French, Mandarin, Thai, Arabic and Greek as well as English. There are festivals in Franklin Park almost every weekend in the Summer. JP has a thriving Arts community which hosts a superb Open Studios event each year. In JP you can learn to paint, make furniture, folk dance, create and develop your own photography, play golf, make ice cream, throw pottery or build a house and that is just on Saturday! If nature is what you crave, there is Franklin Park with it's Zoo, the Arnold Arboretum and the Jamaica Pond with swimming and boating. 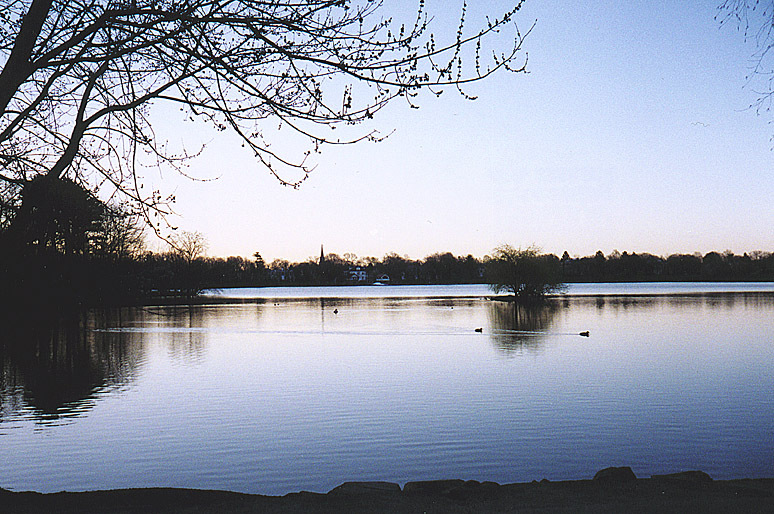 There are bike paths throughout the community as well as running paths through the parks and around the Jamaica Pond. JP has a solid connection to Boston's MBTA transit system and the Amtrak Railway system. Just moments out of the center of Boston, you can feel like you are miles away, surrounded by trees, birds and squirrels. Jamaica Pond at Sunrise...an incredibly beautiful and endangered site. Click on the photograph to find out more about the fight to protect this environment. Following are some links to give you some cultural and historical background on the town I call home. Thanks for taking time to learn about my home. If you're still curious about the area, the link below will map JP for you and you can see where it is in relation to Boston and other places.